Here is something unique - Suffolk's only Orthodox church. It used to be the Anglican St Philip, a chapel of ease to Walton St Mary, since it is technically in Walton parish. 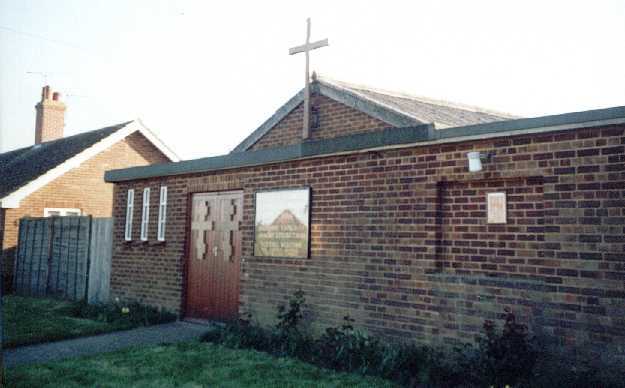 The church was built in 1951, as the Grange estate grew around Felixstowe docks. Although in Walton, the Grange estate was isolated from the largely 19th century Walton High Street, and this was an effective pastoral solution. It is actually two separate buildings, a church and hall side by side, fronted by a rather bleak wall which conceals a connecting corridor. 1951 St Philip. 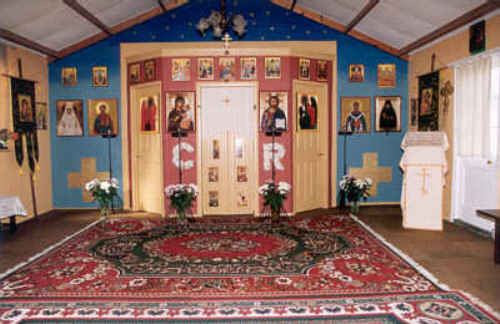 Note the way Orthodox crosses have been added to the doors. As the docks, and Felixstowe, grew vastly beyond all expectation in the 1960s, it held its own as a heart of this often socially challenging community. However, St Philip fell into disuse in 1991 after the construction of nearby Cavendish Community Church - after a few years spent as storage space, it was lent to the Orthodox community. As an Anglican church, it had raked cinema seating, which had obviously been acquired from another building. This has now gone (orthodox churches don't have seating) and the interior is now full of colour, the iconostasis at the opposite end to the entrance. There are now plans to replace the windows with something more fitting. The energetic Father Andrew Phillips here tells me that his community established itself here in 1997, after previously looking at the possibility of Bury St Edmunds. Originally meeting in a room above a shop, they took on the former St Philip in 2000. The Sunday Liturgy is celebrated there, along with daily services - Vespers is most days at 6pm. They also hold an annual Liturgy at St John the Evangelist, in Bury (Father Andrew slapped my wrist, quite rightly, for calling it 'Mass' in an earlier version of this entry) and have active chaplaincies at Ipswich Hospital and Suffolk College. All services are in English. The interior of St Felix and St Edmund, showing the iconostasis. (photo copyright of the church website). Click on the image to visit the website. 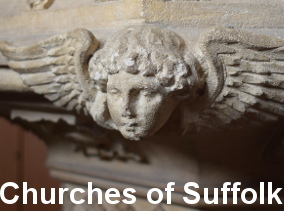 So, who goes to an Orthodox church in Suffolk? Father Andrew tells me that the church has a regular congregation of almost fifty, about twenty of whom are English Orthodox. There are more than ten members of the Greek, Russian and Romanian Orthodox churches, and the rest are in the main converts, seven from Anglicanism, and others who were variously members of Orthodox churches in America, France and Ireland. Father Andrew tells me that they have recently had visitors from Orthodox communites in Finland, Japan, and Arab countries, which makes the whole thing seem delightfully colourful. The two Saints that make up its dedication are, of course, local ones. St Edmund's story is well known; a member of the Wuffing royal family of East Anglia, he was martyred by Vikings in 869, possibly at Hoxne, and the Abbey that grew about his shrine became one of western Christendom's main sites of pilgrimage. An earlier generation of Wuffinga had invited St Felix, a Burgundian, to settle in East Anglia and establish a mission. He built his cathedral at Dumnoc, which was probably Walton Castle, and therefore in this very parish. The church has a really excellent website, and I'm sure that Father Andrew would be pleased to hear from you if you are interested in making a visit yourself. 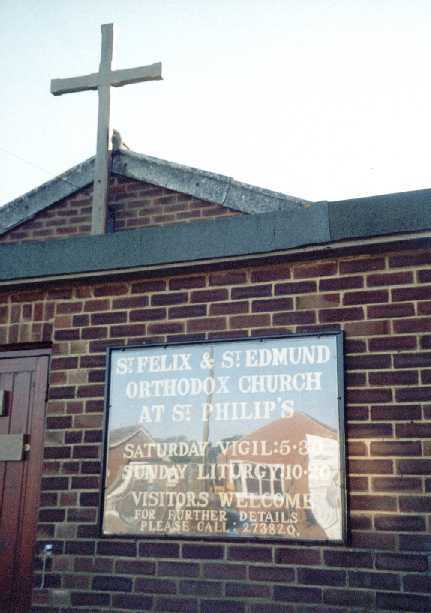 St Felix and St Edmund Orthodox church is located on Wadgate Road on the Grange estate to the north of Felixstowe. Access is easiest from town centre and A12 by going down Garrison Lane and turning right into Mill Lane. Wadgate Road is a turning on the right. I found it locked, but you can contact Father Andrew at frandrew@edmund.felix.tc or on the phone number posted outside the church. You can read more about the story of St Felix and Walton at Sam Newton's Wuffings website.